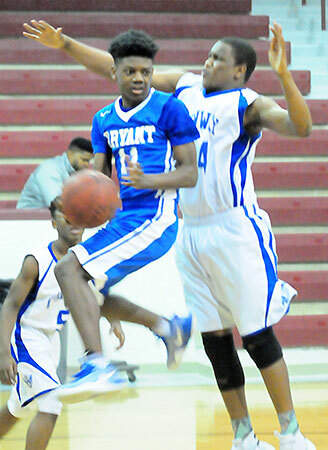 BENTON — With three losses in a row and five in the last six games of the regular season, the Bryant Hornets freshman team needed a fresh start and they got it with the arrival of the Central Arkansas Junior High Conference Wednesday night. And they took advantage by hitting 75 percent of their shots from the field in the second half and hitting just enough free throws including two each by O.J. 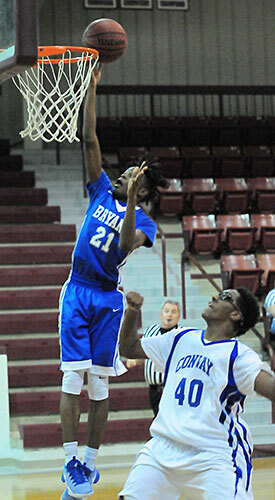 Newburn and Keith Merriweather Jr., in the final 30 seconds to hold off the Conway Blue Wampus Cats, 48-46. The Hornets, now 14-11 overall this season, will take on regular-season champion North Little Rock in the tourney semifinals tonight at 7:15 at Benton Arena with a bid to the finals on the line. In the regular season, North Little Rock defeated the Hornets twice, 51-34, on Dec. 1, 2016, and 48-42 on Jan. 23. In the other semifinal, second-seeded Russellville takes on third-seeded Conway White. 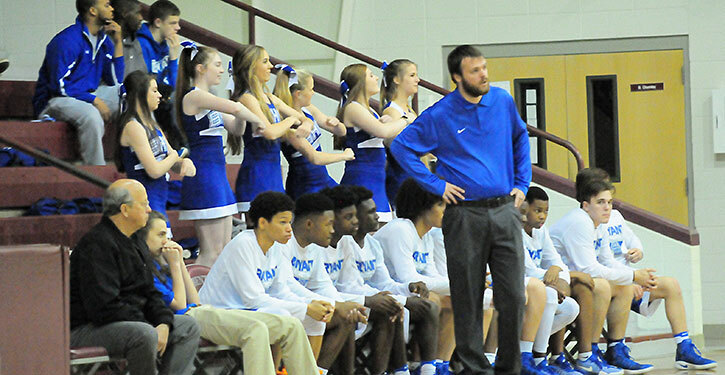 Wednesday’s tournament opener was the third meeting between the Hornets and the Wampus Cats. It wound up being the rubber game of the series. 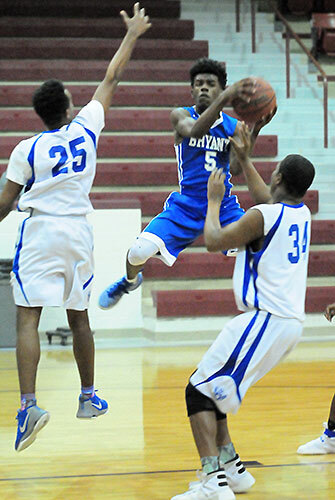 Previously, Bryant defeated Conway Blue 56-54 in overtime on Dec. 5, 2016 but lost to them 51-43 on Jan. 26, part of the late-season slump for the Hornets. 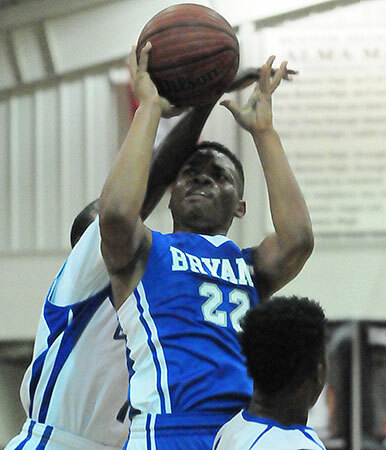 The Hornets built a lead of as much as 10 as late as the 2:25 mark of the final quarter before Conway Blue rallied, in part, due to missed free throws for Bryant, which ended up 14 of 28 from the line on the night including 6 of 16 in the first half. Merriweather led the Hornets with 13 points. Marqelle Barnes and Catrell Wallace each added 9 with Wallace collecting a game-high 11 rebounds. Ethan Hilkert and Newburn finished with 6 points each. 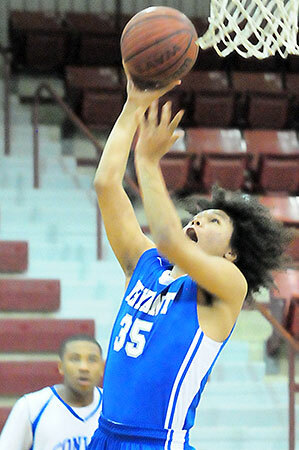 Conway Blue was paced by Xavier Robinson’s 17 points, 12 of which came in the fourth quarter to fuel the rally. Tommy Grady added 10 points off the bench for the Wampus Cats. Chase Boyd had 7 and Trey Tull 6. The Hornets utilized a half-court trap to try to create some energy and some chaos. On offense, led by Barnes, they attacked the basket, resulting in 16 free throw attempts in the first half. The Hornets managed a 16-14 halftime lead despite converting on just six of those 16 tries from the charity stripe. Meanwhile, Conway White, playing mostly a perimeter game — the Cats launched a whopping 21 shots from 3-point range. And they finished 5 of 11 from the free-throw line. “We had a rough couple of weeks there at the end of the season,” acknowledged Hornets coach Tyler Posey. “We really preach, anytime we play, it’s straight attack mode and when we’re going hard, playing with an extreme level of intensity then we’re hard to stop. They bought in and really had a couple of good weeks of practice and it really paid off for us tonight. Ah, but it might not have been so close at the end if they had. The Hornets missed three of their first four free throws during a stretch early in the game in which Conway Blue ran out to a 10-1 lead. Bryant’s first field goal, an offensive-rebound bucket by Hilkert came with 1:18 left in the first quarter. Barnes drove for a basket and was fouled. Though he missed his free throw, Wallace rebounded and missed. Hilkert rebounded and was called for an offensive foul that Posey protested. When Newburn knocked down a pair of free throws with :26 left in the quarter, the Hornets trailed just 10-7. Grady was awarded a basket on a goal-tending call as he was fouled. He missed the free throw and it was 12-7. But Conway Blue didn’t score again until the Hornets had put together a 7-0 push to gain their first lead. Darrick Rose hit a 12-footer off a long rebound. The Hornets then managed to get to the free-throw line for six free throws but converted just once to make it 12-10. A driving layup by Barnes tied the game then Merriweather popped a baseline jumper to put the Hornets in front with 2:11 left in the half. Robert Scott went to the line and tied it for Conway Blue but, moments later, Grady came up empty on a two-shot trip to the stripe. With 1:09 left in the half, Merriweather converted twice to make it 16-14, the score that held at the half. Fired up out of the locker room, the Hornets opened the third quarter with two quick baskets that gained some separation and forced the Wampus Cats to take a timeout. Out of the gate, the Hornets worked a play that featured a high-low feed from Wallace to Hilkert for a layup. Merriweather then made a steal and a layup to stoke the Hornets’ fire. Bryant would convert 6 of 7 shots from the field in the quarter but they couldn’t shake the Cats. Chase Boyd got Conway’s first basket out of the timeout but Barnes fed Colby Washington for a basket. Trailing the Hornets 26-21 with 1:42 left in the third quarter, Conway Blue, sparked by Grady’s 7 points including a pair of 3’s, surged to a 31-28 advantage. Bryant countered as Wallace hit a free throw and, with just :02 on the clock, Hilkert fed Wallace with a lob pass that resulted in a basket that tied the game at 31. The Hornets then opened the fourth quarter with a 10-0 run. Newburn hit a layup, Hilkert drained a 10-footer off a drive, Merriweather scored off the offensive glass and Barnes drove for a layup to make it 39-31. After Boyd missed for Conway and the rebound went out of bounds off the Cats, they took a timeout. With 3:18 to go, Wallace scored off the offensive glass to produce the first double-digit lead for the Hornets. After Robinson and Wallace traded buckets, Conway Blue started its rally. With :32 left, they had cut the margin to 44-40 as three trips to the line for the Hornets produced just one point. But Newburn converted a pair with :27.1 showing. Tull answered with a 3 to make it 46-43 before, with :07.6 left, Merriweather knocked down a pair to make it a two-possession lead. The Cats could managed just one possession and, though Robinson drained a 3, time ran out on them. Tull 2-14 1-2 6, Boyd 3-8 0-1 7, Robinson 6-14 4-4 17, Williams 2-2 0-0 4, Scott 1-2 0-1 2, Grady 4-5 0-3 10, Kaiser 0-0 0-0 0, Orr 0-0 0-0 0. Totals 18-45 5-11 46. Rose 1-4 0-0 2, Merriweather 3-7 7-11 13, C.Washington 1-2 0-0 2, Barnes 4-11 1-9 9, Wallace 4-7 1-2 9, Hilkert 3-5 0-0 6, Newburn 1-2 4-4 6, West 0-1 1-2 1, Drennan 0-0 0-0 0. Totals 17-39 14-28 48. Three-point field goals: Bryant 0-5 (Merriweather 0-2, Rose 0-1, Newburn 0-1, West 0-1), Conway Blue 5-21 (Grady 2-2, Tull 1-11, Robinson 1-6, Boyd 1-2). Turnovers: Bryant 12, Conway Blue 16. Rebounds: Bryant 10-24 34 (Wallace 2-9 11, Barnes 1-4 5, Hilkert 2-3 5, Merriweather 2-1 3, Rose 2-0 2, C.Washington 1-0 1, Newburn 0-1 1, West 0-1 1, team 0-5 5), Conway Blue 8-19 27 (Williams 1-7 8, Scott 3-3 6, Tull 1-3 4, Boyd 0-4 4, Robinson 3-0 3, Kaiser 0-1 1, team 0-1 1). Team fouls: Bryant 13, Conway Blue 20. Technical foul: Conway Blue, book.